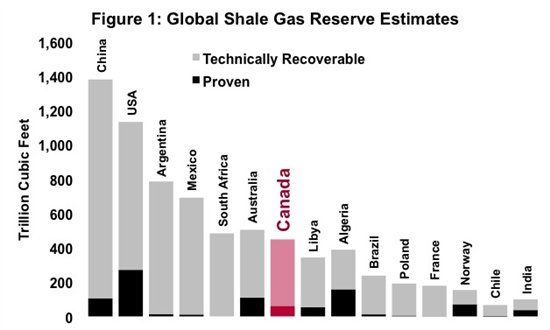 Sticking out of the chart like a drill pipe is the potential of shale gas in China, an astounding 1,275 Tcf. To put this in perspective, 1,000 Tcf of natural gas contains the equivalent energy to 166 billion barrels of oil – a staggering amount considering that the discovery of 10 billion barrels of conventional oil these days is a rare occurrence, worthy of many headlines and even a few conferences. Another comparative measure is what’s known to be recoverable in Alberta’s oil sands. Only a handful of years ago the EIA recognized that the bituminous region around Fort McMurray contains 170 billion barrels of proven oil reserves – almost exactly the same amount of energy as 1,000 Tcf of natural gas. The BCG study, “The Return of U.S. Manufacturing,” makes an interesting case. China’s wages are rising by 15 to 20 percent a year, while its productivity will improve at half that rate. The yuan is gaining in value, too, and Chinese-made products are destined to become more expensive. The math that went into this study is impressive, and it works like this: Right now, labor costs in China are slightly less than half those of the U.S. when the difference in productivity is factored in. In five years’ time, labor costs on the mainland will be 70 percent of the U.S. figure. Counting costs such as inventory and shipping, the study says, the Chinese cost advantage will drop to single digits or disappear entirely. Caterpillar, which has a major presence in China, is building its next plant to make excavating equipment in Texas, tripling its capacity for such equipment in the U.S.
Ford is repatriating 2,000 jobs from China after reaching an agreement with the United Auto Workers that it says it can live with. NCR has already brought its production of automated teller machines back from China to shrink the time from production to market, to stitch divisions closer together and lower operating costs. The toy maker Wham-o (and this is my favorite) is repatriating half of its production of Hula Hoops and Frisbees, most from China, some from Mexico. Recent growth in manufacturing is due partly to a come-from-behind context. True, the U.S. has added 250,000 manufacturing jobs since the start of 2010. Also true: It lost almost 6 million jobs in the past decade, including a third of all employment in manufacturing. Growth in industrial production is concentrated in a few sectors such as oil and computers. “The Case for a National Manufacturing Strategy,” a new study by the Information Technology and Innovation Foundation, a Washington public-policy group, indicates that 15 of 19 sectors, accounting for almost 80 percent of U.S. industrial output—apparel, metals fabrication, machinery, printing, and so on—declined over the past decade. The U.S. strategy, such as it has one, is fundamentally different from those of Europe and Japan. Their manufacturing sectors are stable or better because they have automated drastically (Japan) or gone into high-end production (much of Europe). The U.S., by contrast, has lagged in capital investment and appears set to compete primarily by way of low wages and often costly packages of tax breaks and other incentives. Commodity prices should be firm…. I just returned from a conference with some of the world’s leading money managers, and one theme was clear: there has been massive underinvestment in the global supply chain of industrial metals and raw materials. This is less about oil and gas than about things like copper, iron ore, palladium, titanium, zinc, rhodium, and a host of other “iums” that are the essential, irreplaceable inputs for the industrial world that we all inhabit and that billions are on their way to inhabiting. Simply put there is yawning gulf between demand and supply, and it cannot be narrowed in the coming decade be bridged by technology or spending. That means we are in for a period of rising commodity inflation, including oil and of course food as more people consume more calories and crop yields strain to increase. That may not show up in normal ways that we calculate inflation, and it may not affect the decreasing cost of consumer goods in the western world for some time. But it is a challenge for companies, and the only way they can maintain profitability is through a combination of technology, more efficient business models and keeping labor costs in check. In short, low consumer inflation in the United States may be good, but its less appealing twin is the relentless pressure on wages and companies being loath to add costs by adding jobs. So unless China truly implodes or Brazil stops growing, or hundreds of millions in India and Indonesia stop believing that they have a right to the same middle class lifestyle that has characterized the West for the past century, we are at the early stages of a spike in commodity prices the likes of which we have never seen. 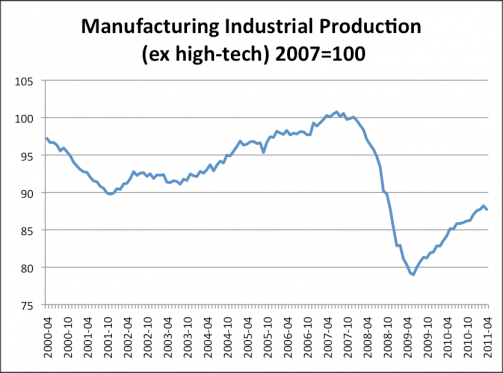 Manufacturing is not declining, we are all getting richer? As a share of GDP, manufacturing has declined in most countries since the 1970s. A few examples: Australia’s manufacturing/GDP ratio went from 21.3% in 1970 to 9% in 2009, Brazil’s ratio went from 24.6% to 13.3%, Canada’s from 21.7% to 11.3%, Germany’s from 35% to 19%, and Japan’s from 35% to 20% (I’ll maybe create a chart with a more complete list). 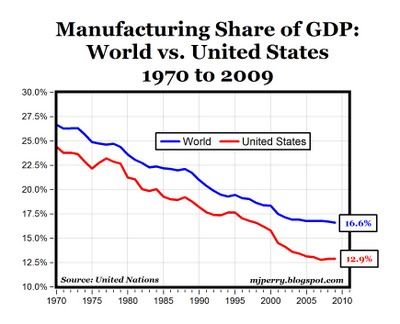 Bottom Line: The complaints about the “decline in U.S. manufacturing” are really a somewhat misguided acknowledgment of the global shift in production that has taken place since we entered the Information Age with the commercial introduction of the microchip in 1971 and gradually left the Machine Age behind. When we complain that “nothing is made here anymore,” it’s not so much that somebody else is making the stuff we used to make as it is the case that we (and others around the world) just don’t need as much “stuff” any more in relation to the overall size of the economy. The standard of living around the world today, along with global wealth and prosperity, are all much, much higher today with manufacturing representing 16-17% of total world output compared to 1970, when it was almost twice as high at 26.7%. And for that progress, we should applaud, not complain. 2) Overbought: S&P 500 within 1% of its upper Bollinger band on a daily, weekly and monthly resolution (20 periods, upper band 2 standard deviations above the moving average), and S&P 500 at least 20% above its 52-week low. 3) Overbullish: Investors Intelligence bullish sentiment at least 45% and bearish sentiment less than 25% (presently, we have 54.3% bulls and 18.5% bears). 4) Rising yields: Yields on the 10-year Treasury and the Dow 30 Corporate Bond Average above their levels of 6 months earlier. So not including the cluster of signals we’ve observed in recent months, we’ve seen 6 clusters of instances in post-war data (we’re taking the 1997, 1999 and 2000 cases as separate events since they were more than a few months apart). 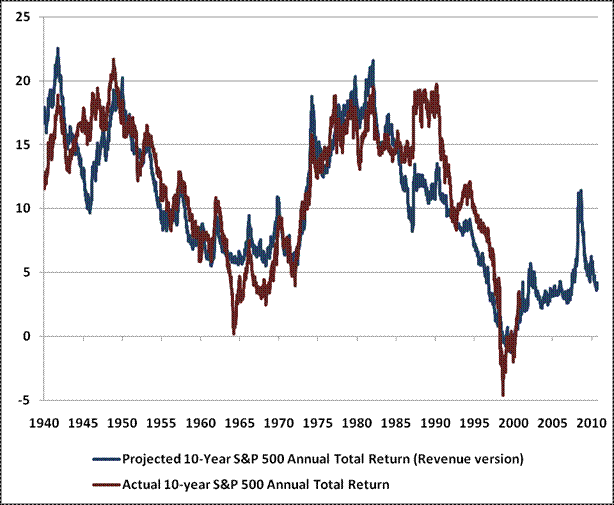 Four of them closely preceded the four worst market losses in post-war data, one was quickly followed by a 12% market decline, and one was a false signal over the short- and intermediate-term, yet the S&P 500 was still trading at a lower level 5 years later. 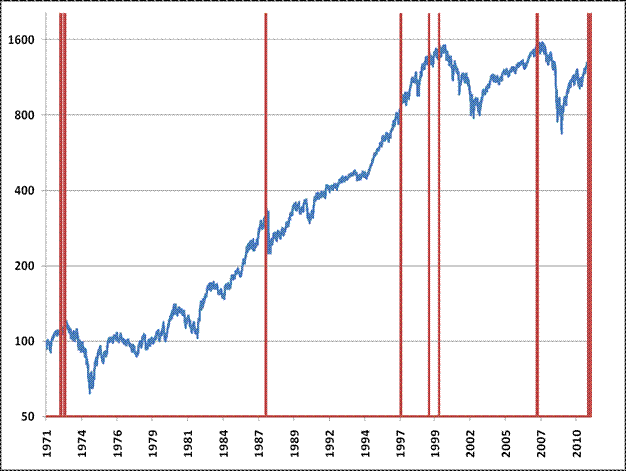 The red bars indicate instances of this syndrome since 1970, plotted over the S&P 500 (log-scale). The notion that a college degree is essentially worthless has become one of the year’s most fashionable ideas, with two prominent venture capitalists (Cornell ’89 and Stanford ’89, by the way) leading the charge. It’s bad enough that our colleges are under­performing, one can’t help thinking—but do they have to charge so damned much? In the past 30 years, private-­college tuition and fees have increased, in constant 2010 dollars, from $9,500 a year to more than $27,000. Public-college tuition has increased from $2,100 to $7,600. Fifteen years ago, the average student debt at graduation was around $12,700; in 2009, it was $24,000. Over the past quarter-century, the total cost of higher education has grown by 440 percent.